Previously, on MinerBumping... Agent Syds Sinclair infiltrated a mining corporation and awoxed them, swiftly inflicting a billion isk in damage. The "victims" identified Agent Tubrug1 as the source of the problem and began asking for a refund. 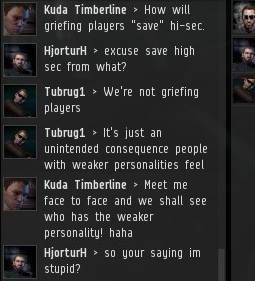 When he refused, they demanded to speak with the Saviour of Highsec himself. An escalated petition! 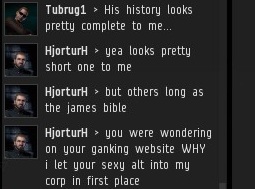 Although they didn't want to speak with my alt, Currin Trading, they had to make do; I was in the middle of ganking operations. I gave them what solace I could. The other shoe dropped: The carebears were convinced an employment history exploit was at work. The CEO of a highsec mining corporation would never fail to do his due diligence. 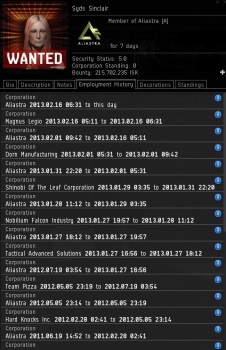 A bug must have artificially shortened the awoxer's corp history. Would a carebear blindly accept a corp application from someone with an employment history like this? Surely not. But just in case, maybe they should whine for CCP to nerf awoxing by putting a red flag on corp applications from such evildoers. Perhaps a recruitment "rebalance" is in the works? It's amazing how many corps get AWOXed because of that "I can't be bothered to actually look at a recruit's job history" bug. The short of it: Tubrug leads yet another New Order charge to victory, fearless vanguard of the Code that he is. Non-compliant parties cry. All in another day's work for a staunch defender of the Code.